Marble is a type of metamorphic rock which is characterized by swirls of colour from impurities and the ability to take a very high polish. This stone has been used for thousands of years in art and architecture, and it continues to be very popular today in applications ranging from garden paving stones to mantles. A variety of metamorphic rocks including granite are sometimes called “marble,” but true marble comes from either limestone or dolomite. As these sedimentary rocks undergo heat and pressure, they recrystallize, forming marble. When cut into slabs, these impurities can create striking and fanciful designs. Firstly we come in and using diamond Pads a Rotary floor polisher and wet vac device we strip back the floor of any existing polishes and seals to where the floor resembles it’s Natural State. 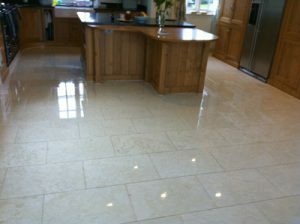 Obviously being a Natural stone its prone to Acid erosion so no Acid based cleaners or bleaches should be used. We use a combination of Alkaline/Akali-Solvant based cleaners. Once the floor is prepared we leave it to dry over night. This is highly important as the marble will retain moisture and will react with the seals/polishes. Beware any company who say they can do this all in a day! Next day we come back and apply the Seals/Polishes. 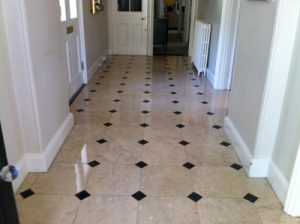 Sounds simple but take my word there is an absolute art to this especially when your talking polishing a floor. You need patience a keen eye and attention to detail. Seals and polishes are built up some require 2 coats some 5, its the Technicians job to be able to judge this……..
After each coat the floor is buffed back to avoid application marks. Each coat will take 30-45 mins to dry the floor will be ready for light use (Walking on) 2 hours after last coat heavy traffic (Moving furniture around) that evening.